As I was listening to some K-ballad music back in my university days, I came across a few songs by Neon Bunny. I was entranced by her mysterious angel-like voice and captivating lyrics that are related to cities and life experiences. At the moment, a few of my favorite songs are Forest of Skyscrapers and Romance in Seoul which has a mix of modern and traditional sounds. Also, the music videos are beautiful in transition of cities and culture within space and time. There are times that I would listen to her songs while having drinks at a cafe, a bar or even at home. Her songs soothe one’s mind that these will make you feel relaxed. Im Yujin, with her stage name Neon Bunny, was in a K-indie rock band The Black Skirts before she started her debut with Seoulight in 2011. In 2012, she released an EP Happy Ending and then, in 2014, she released the single It’s You. This year, she released Forest of Skyscrapers and had her oversea tours at the SXSW followed by a short Europen tour in Warsaw (Poland), Poznan (Poland) and London (UK). 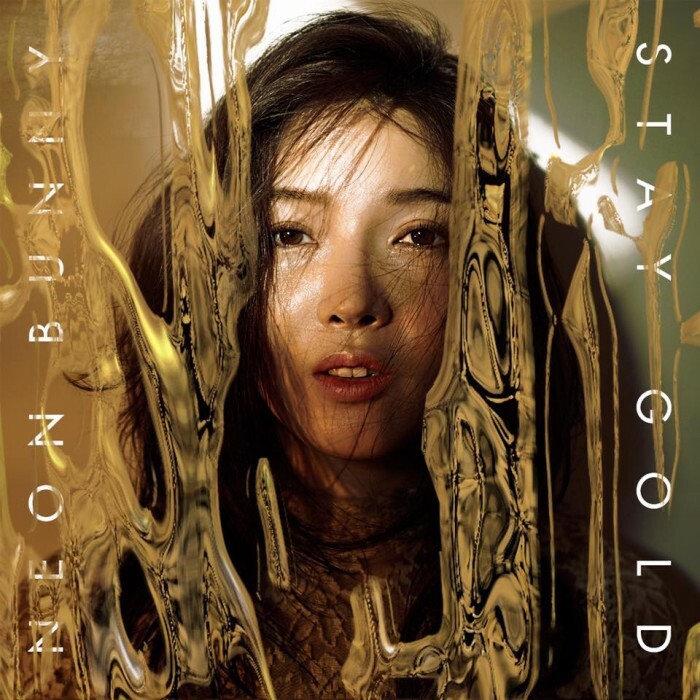 Her new and upcoming album Stay Gold will be out on 13 July. During the video call interview, Neon Bunny talked about her music and experiences of her oversea tours. She also mentioned about her upcoming album. How did you start having passion in making music especially electro-pop music? Are there any musician that influenced you to start your passion? How did you come up with the stage name, ‘Neon Bunny’? I like bunnies and I collect any items related to bunnies. From there, my stage name is ‘Neon Bunny’. You started in an indie band, The Black Skirts. What made you decide to go solo as a singer-songwriter? I wasn’t really involved in The Black Skirts such as songwriting. I was the keyboardist for the band. I wanted to go solo because I want to write and sing my own songs. You made collaborations with both local and global artists like Gate, Demicat, Smells and Spazzkid. I wonder how you meet and how is the process in making the music when working with other artists? They contacted me through e-mail. They are interested in collaborating with me in making songs. I met Demicat in person when he had a gig in Seoul. Normally, we come together and discuss what kind of songs that we could produce. This year, you released an EP, Forest of Skyscrapers. The MV was inspired by Wong Kar Wai’s films and Akira’s animation films. Could you talk about how you started producing this song and MV? It took two years to produce the music video. First of all, it cost a lot of money for musicians so it took some time to make the music video. I talked with the director and wanted to create the video with a new and different Wong Kar Wai’s style. However, the music video is banned from being viewed in Korea. Romance of Seoul has a mix of modern and traditional sounds such as jazz and gayageum. How you started producing Romance in Seoul? How did you manage to balance out the music between modern and traditional sounds? I have been thinking a lot when making this song. When putting gayageum alone in the song, it will sound old with lack of uniqueness. In Korea, we hardly put gayageum in pop music. I enjoyed listening to lots of jazz music. I always wanted to be a jazz musician but I couldn’t because I don’t have the talent for that. I used to play the jazz piano. I wanted to develop the Korean style jazz instead of American. Forest of Skyscrapers and Romance in Seoul reminds me of the modern cities and loving Seoul. What makes you fell in love with Seoul? I have a love and hate relationship with Seoul. Although I was born and raised in Seoul, honestly, I like Seoul but I don’t really like Seoul. I prefer the traditional culture in Seoul but the atmosphere is too fast and modern. So, I have to keep up with it even though it is exhausting while living in Seoul. You started with your first full album, Seoullight which is has a bright and happy mood. Year by year, your songs started to shift a slightly more mature sounds in terms of lyrics and style. What kind of inspirations influence you in making music? Also, how you gather inspiration, both Western and Asian, and input in your songwriting process? Mostly, I gain inspiration from reading books and working a lot that influence my songwriting. As I grow older, I started to produce more mature songs than Seoullight. As songwriters, we are influenced from Western music but, at the same time, we are concerned about the originality of music. I cannot compete with US R&B musicians because they are talentedly good and I cannot be like them. I rather have my own voice in making and singing my own songs. You recently announce on your Facebook page that your new album Stay Gold will be out on 13 July. Could you talk more about your album? The album consists of five new songs and other songs that are already out such as Romance in Seoul and Forest of Skyscrapers. This year, you had your oversea gigs at the SXSW and in a few European countries. How did you plan out in making preparations for oversea gigs? How was it like in performing outside Korea? It is really amazing that I have the opportunity to perform outside Korea. When I was at the SXSW, I was surprised that the fans know my lyrics and sing along with my songs. SXSW is an awesome and great festival that gathers musicians. I enjoyed performing there. Plus Social helped to organize Asian music in Europe and they helped us out in having our gig in Poland and London. In Poland, people are beautiful and kind. The London show was the best. The audience are nice and they buy lots of my CDs. Previously, I was angry that the promoter in London cancelled our show. We had already planned out and let the fans know that we will be performing in London. I did not want to let them down. During that time, Jason contacted me and he helped out in booking a place for us to perform. Overall, London is the best show that I performed in the European tour. Aside from the extra costs on extra baggage for our flight from Poland to London, London is still the best and we enjoyed ourselves. Following up with the above question, what are your best and worst memories of your tours? SXSW is the best. I went to school in the US a long time ago but I have to head back to the US because of the visa issue. This time, I was able to go back to perform in the US. I didn’t really expect people to come to my show and I was really surprised. Poland is a beautiful country but there are a lot of K-pop fans. They categorized me as K-pop artist. It was a bit awkward when they were there to watch the performance. We took the Russian airline. They are the worst airline I have ever been to. Never ever take that airline when you consider travelling overseas. Do you have any plans to have more tours in other countries? I hope to perform at the SXSW next year. I also hope to have the US tour. Might be next year. K-indie has started to become known not only in Korea but also globally especially musicians like yourself have the opportunity to perform overseas. What are your thoughts on that? It is really nice that, not only me but, other musicians have the chance to perform in the US, Europe and Asia countries. In Korea, the population is not that big. Even though there are popular K-indie musicians, not many people listen to them because of the population. So, people who listen to them are really small. In other countries, people enjoyed listening to indie music. For example, in Northern Europe, they like to listen to metal music. It is really a good opportunity to perform. Despite having a tight budget, we still have the chance to perform overseas. K-indie’s awareness in local and global market is still a long way to go. You have been in the music scene for 15 years. What have you learned so far as a musician and how do you see yourself in the next five years? Hopefully, no matter what things come to me, I still want to be musician. No matter whether the album goes well or not, I still keep making music. Any message that you would like to say to your readers? I don’t know how you guys know me, find and listen to my music. Thank you so much to listening to my music. It really means a lot to me. My album is coming up is really soon. Hope you guys will like my album when it’s out. Thanks to Neon Bunny for her time for taking part in the interview. Hear some of her songs on Soundcloud, Bandcamp and Spotify. Follow her updates on Facebook, Twitter and Instagram. Her albums and singles can be purchased through iTunes and Bandcamp.